College can be costly these days as tuition rates continue to rise steadily year over year. For many parents, a 529 plan is the preferred way to save for college. Total investments in 529 plans topped $328 billion through the first half of 2018, with the average account balance reaching $24,153. Among the chief benefits of 529 plans are tax-deferred growth and tax-free withdrawals when savings are used for qualified education expenses. These plans also offer more generous annual contribution limits for savers. As of 2019, individuals can contribute up to $15,000 per 529 plan, per child without triggering gift tax. The contribution amount doubles for married couples filing a joint return. Additionally, the 2017 Tax Cuts and Jobs Act expanded the scope of 529 savings plans, allowing parents to use them for secondary education expenses at private schools, along with college expenses. With the ability to enroll in any state's plan, regardless of which state you live in, 529 accounts offer flexibility and freedom of choice. And, unlike a Coverdell Education Savings Account, 529 plans don't require mandatory withdrawals by the beneficiary's 30th birthday to avoid a tax penalty. In fact, a leftover 529 plan can be rolled over to a new beneficiary, a process that may be continued indefinitely until the savings are exhausted. With those advantages, the possibility that there are disadvantages of 529 plans may not cross parents' minds. However, there are some potential downsides to be aware of. Surprisingly, there are a few things that could make 529 plans lose some of their appeal in the eyes of savers. But, it's important to weigh them carefully against 529 plan advantages. A 529 plan is not the same as a traditional savings account. Rather than simply earning interest, money added to a 529 plan can be invested, typically in mutual funds although some plans may also offer exchange-traded funds or individual stocks. On one hand, that's an advantage, as investing in the market typically yields higher returns than simply earning interest. As your returns compound over time, your money has an opportunity to grow faster. The potential stumbling block is choosing a plan with less variety in its investment offerings. For instance, you may only be able to invest in a handful of target-date funds. While target-date funds have their benefits for college savings, as they adjust their asset allocation automatically based on your child's expected college entry date, you don't have control over the individual assets within the fund. Limited investment options may not afford the level of diversification you're seeking. Just like with any other investment vehicle, there are fees associated with 529 plans. These fees are linked to the individual investments themselves that are held within the plan. If you choose investments with higher management fees, those fees can easily detract from the returns you're earning. In other words, your investment dollars have to work that much harder to generate solid returns to make up for the fees. If you overestimate your child's education costs and withdraw more money than you need, the penalty would apply to any of the money not used for qualified expenses. On a larger withdrawal, that could add up to a sizable addition to your tax bill. With college savings plans, it pays to be the early bird. The sooner you open a 529 account and start contributing regularly, the longer your money has to grow. And the longer it has to recover from market ups and downs which may naturally occur during the time frame in which you're saving. If you're getting a late start, you may have to play catch up by contributing larger amounts in order to reach your target college savings goal. You also have a shorter window for seeing your investments recover if market volatility results in losses in the last few years before your student goes off to college. Is There a Better Way to Save for College? All things considered, the disadvantages of 529 plans can be outweighed by their advantages. For some parents, however, it might make more sense to save elsewhere. A Roth IRA, for example, could double as a college savings account as well as a retirement account. With some exceptions, you're always allowed to withdrawal the original amount you've contributed without paying income tax or an early withdrawal tax penalty. There's no 10% penalty when Roth IRA withdrawals are used for qualified higher education expenses. Ordinary income tax may, however, apply to any earnings withdrawn from your account prior to age 59 1/2. Of course, using a Roth IRA for college isn't perfect either. If you don't follow the rules carefully, you could still trigger income tax or penalties. And the money you're withdrawing for college is money you'll no longer have in savings for your own retirement. 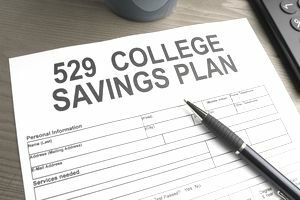 If you're not completely sold on a 529 plan, saving in a high-yield savings account or CD account is another alternative to consider. You may not see as much growth compared to a 529 but it would allow you to keep your retirement savings intact while still planning for your child's education.